Ships from USA. American owed & operated. 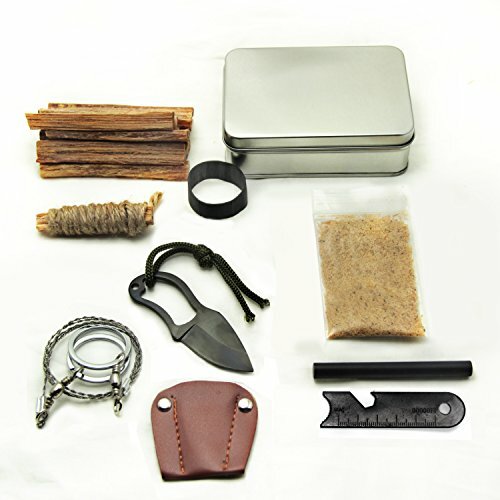 The perfect gift for anyone interested in survival, bushcraft, camping, hiking, fishing and other outdoor activities. Ships from USA 100% Satisfaction Guaranteed. Fire starting survival tin container fits in pocket, full of everything you will need to start a fire. Fatwood sticks, ferro rod, striker, fatwood chips/dust, jute, survival hand saw and a fixed blade stainless steel pocket knife. l have used fatwood sticks while backpacking the Pacific Crest Trail from California to Canada. They make it very easy to start a fire. Fatwood has been use for 100's of years to start fires. Naturally soaked in the trees resin. No chemicals used here, non toxic, safe to handle. Ignites instantly, burns very hot. Cut from dead pine stumps left after logging, we never cut live tree's. Use to start a fire anywhere. Perfect for your survival kit, backpacking, bug out kits, hiking, preppers and camping. Fatwood never lets you down in emergencies. Jute lights on fire very quickly with sparks from a ferro rod. Lights in all kinds of weather, just place on top of some fatwood chips/dust. Use the striker or the pocket knife to create sparks from your ferro rod. Fatwood chips/dust saves you time, no need to make tinder, it is already made for you. Also includes a durable stainless steel 3 1/2in long pocket survival knife, 440C stainless steel, hardness 57HRC, black color,survival cable hand saw stainless steel 21in long blade, 3 inch striker for use on ferro rod to create sparks, 48in piece of jute, cut a 2in piece off and fray the end, place on top of fatwood/dust to start a fire instantly. This pocket fire starting survival kit is put together one at a time the old fashioned way, in the seaside village of Ventura, California, USA. Thank you for looking, Steve Kaeser.